If you don't have a toddler in your house, you might not realize how much they dawdle. Put two toddlers in your house and you will have double dawdling. And so it was the other morning when the twins and I were walking up the driveway after getting Pierce onto the bus. Cort came right inside, but Reid persisted in trying to amass a large rock collection out of the oh-so-interesting gravel that makes up our driveway. I was standing, front door open, calling him inside, when I heard a buzz that went straight by my head. I assumed I had let in a bumblebee, and knew I'd have to take care of it in a minute. But as I continued to call for the epic-slow Reid, the buzzing persisted - loudly. That is one HUGE bee I thought. Finally, I stopped in my calling and turned to the side to look, and there I saw a little hummingbird frantically trying to get out through the windows and sliding glass doors. I knew this little guy would be a challenge to catch. Once I got Reid in the house (finally, and sans massive gravel rock collection), I got the boys' butterfly net. The hummingbird was busy flying over and over again into our sliding glass doors. It turned out he wasn't hard to net at all. I guess I got lucky. The twins were thrilled there was a bird in the house. I promptly took him out of the net and carried him outside, his little chirps resonating in my ears. Poor little thing was so scared. I quickly snapped a couple of pictures before setting him free. Holding such a tiny being in my hands - even just for a few seconds - was not something I ever expected to happen in my lifetime, but it is something I will always remember. Such a fragile creature, with the needle thin beak and his beautiful green shimmery feathers. 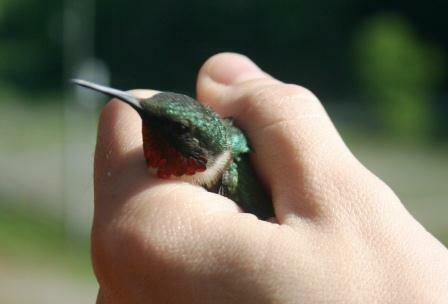 Someone on Twitter said that holding a hummingbird is almost like petting the mythical unicorn. And indeed, it was a magical moment of wonder. I'm going to keep my eye out for unicorns from now on, just in case. How cool! I think you are going to have good luck from now on out. WOW! This is just amazing. Your heart must have been in your throat...at least mine would have been. I'm so glad you were able to snap some pictures. I'm so jealous! Love hummingbirds and it would be wonderful to hold one and see it that close up. They are such fast little boogers, aren't they? How fun for you. I'm still amazed that you were able to catch him. They're so fast. I'm jealous too! 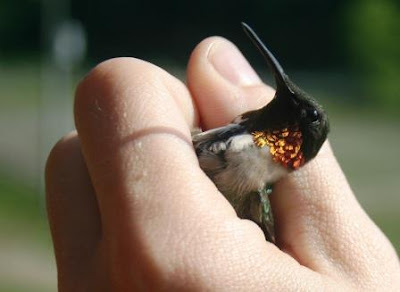 It would be totally awesome to be able to hold one of those tiny, beautiful birds! Wow! Amazing! I can only imagine what that felt like! Beautiful! I'm so glad you had that experience. I did about a year ago. I was walking up the front steps of the building where I work, and I saw a hummingbird lying on the steps. I thought it was dead. I couldn't stand to think of it there, where it might be stepped on, so I decided to move it off the steps and place it in the flower bed beside them. As I picked it up, it came to life! Apparently it was stunned (that's what someone told me). Briefly feeling that hum of life was amazing. Wow what a catch, I hope you have feeders for them so the boys can watch more.When I have banded birds the fun part is the release. so glad you were able to return him safely to the outdoors. beautiful, tiny thing. ooohhhh i just love these little guys. i have heard they will drink sweet water right from your hand with just a little time and patience. the boys would enjoy it!! So neat! They are so tiny. You are honored. That IS incredible! We saw a dead one once and marveled at it's tiny size--imagine holding a live one! What a miracle! "Double dawdler"--that cracked me up. So cool! I love hummingbirds! Glad you were able to catch him, and get to hold him for a few seconds too. I'd never forget that either! Not in a million years would I have guessed to read this today... and how cool for the boys to see one so close! Wow, how cool is that! Nice save! I've certainly never held one before. Lisa! I am just in awe of this. What an amazing experience. Glad you thought to get a couple of pictures before setting him free. Glad you got him outside to safety before his heartbeat reached the speed of his wings. Wow, so very cool! I love hummingbirds. My Dad has to rescue hummingbirds on a regular basis from his garage. He lets them fly until they are pooped. He carries them outside and puts an eyedropper filled with nectar to the beak. Their tongue wil dart out to get the drink. Soon enough, they have refueled and zip on their merry way! That is so cool Lisa! My husband has held one in his hands that was in our garage that he captured and let free. I will spare you the details of the one that I held because it was sad. Wow, that sounds amazing. Glad to hear he was ok. It looks so precious! Glad he made it back outside. I caught one in the barn rafters once. It was trying to get out a window, and couldn't. I just grabbed for it, and it was in my hand. I felt its little heart beat. Yes magical just like for you. Soooo cool. :) I love that you were able to take pictures, too! Wow...what a treat. Once in a lifetime, I'm sure! That is amazing and what a thrill! Glad you were lucky in getting him so quickly. That's amazing! I can't believe you actually caught one!